I served this up at the party, thanks to my friend, Vicki! 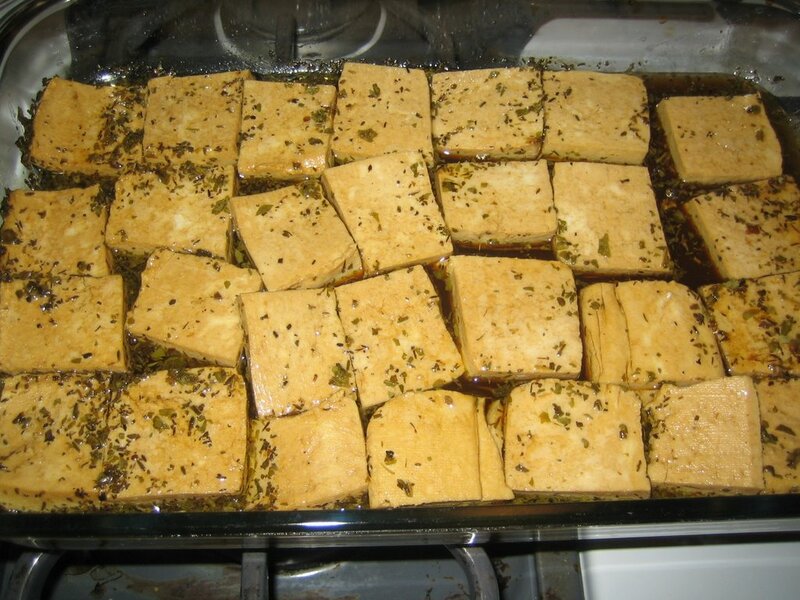 You see, she has been making my Lemon-Herb Tofu from Vive , and loving it because it is quite tangy from the lemon juice. But... one of her kidlets doesn't like tofu in cubes, or chunks. So, one day she said "you know, last night we had your lemon tofu but I mashed it up a little and served it over quinoa... it was delicious and the kids loved it". 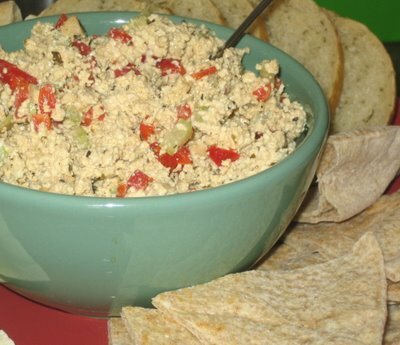 So, that gave me an idea, because normally for parties I do a batch of Marinated Tofu Sandwich Filling from TEV , and instead of actually finishing the sandwiches, I just pop the finished mixture into a bowl and put some pitas and tortilla chips around it for people to pick up on their own. I thought... "okay, I'm going to do something similar with the lemon tofu". Mostly because the clean-up is easier (no skillet to clean, just a baking dish to toss into the dishwasher - yay!). 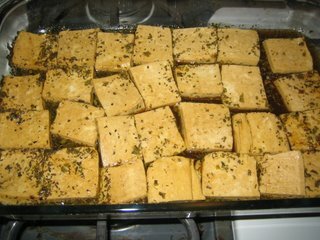 So, I made the Lemon-Herb Tofu the night before (here it is after baking in all its lemony-herb and oil goodness) and the next morning I mashed it (you can also whiz it in a food processor to almost instantly mince it! ), mixed in some finely chopped celery and red pepper, a few good dollops of Nayonnaise (you could use Vegenaise), and then into a bowl it went, surrounded by some sliced breads and pitas. It was delish, and so incredibly easy!! YUM! It's funny because my boyfriend doesn't like tofu in chunks or cubes either...so, this would be perfect for him! If I took some of this on a picnic, do you think it would keep well? Do you have any other picnic ideas? It's already getting hot here...and the best thing about summer is picnics...and swimming, ofcourse! Ooh, that looks so good. I've been eating a lot of tofu lately. Yummy idea. dreena, i'm having some trouble replacing white flour in some recipes i'm wanting to try.. can you give me a quick lesson on how much to substitute? i'm mostly interested in subbing whole wheat (bread or pastry) or spelt for the white stuff. it would be so great if you could include a guide like this in your next cookbook! i have these muffins i really want to try, but i refuse to buy white flour! I tried that with the leftovers the one time I did the lemon herb tofu...I didn't add tomatoes...I bet they would have made it better! I will try this one again...of course you know my trials and tribs with tofu...hahaha! Thanks for the extra push on this. Oh! Could you please, please, please post some vegan camping ideas and/or recipes! it's that time of year...almost! Excellent idea! I love the lemon herb tofu anyway, but this would be great for partays, etc. Thanks krispycheks... your Lo Mein post with the tofu the other day looked great - and your seitan kebabs - I wish I could buy some decent seitan here - just 1 brand and I don't like it much. Hi Michelle! I'm with you on the white flour. At least for everyday foods like muffins and things. For birthday cakes and cupcakes I do break out the white flour, but even for cookies I find I can use barley, spelt, or ww pastry flour and they are just fine. Anyhow, in my experience, I have found that you can sub ww pastry flour equally for white flour with great results. Also, this is generally the case for barley and spelt flours - except of course the consistency will certainly be more grainy and coarse. I have used a fine grain, sifted spelt flour before that is almost like white flour, and with that I have had to add a little extra flour to equate for white - for instance, with 1 cup white I would use 1 cup spelt with 2-3 TB extra of spelt. I think you should go ahead and try some of your recipes using the other flours, and even going maybe 1/2 ww pastry and 1/2 barley or spelt - just to soften the texture of the final product. Does this help any? Thanks for the suggestion about putting some of this in the next cookbook - good idea! Thanks, dreamqueen - yeah, it's a great party dish - makes a good portion, plus it is so simple!! I used barley flour (at least I think it was barley flour I have 3 flours right in a row in my cupboard so, I think that was the one I choose) instead of Spelt? Yours called for spelt, I think, right? Then, instead of soy milk I used applesauce. Without even thinking of it until afterwards the applesauce had cinnamon in it...so that added a little sumpin', sumpin', ya know? So, anyhow, I was very surprised at my attempt...so much so I am thinking about driving across town during my lunch today to deliver one to my dad at work! Thanks for the info! I have some Agave Nectar - didn't even think of that (replacing it for sugar) thanks! And, yes, Agave Nectar, at least the kind I buy, is approved by the Diabetic Association!! !